SO disappointed all custom Amnesia stories are still all the base content. Agreed, but not disappointed at all. Not yet, at least. There's still much to do with the base content IMO, depending on how good the plot and gameplay are managed. 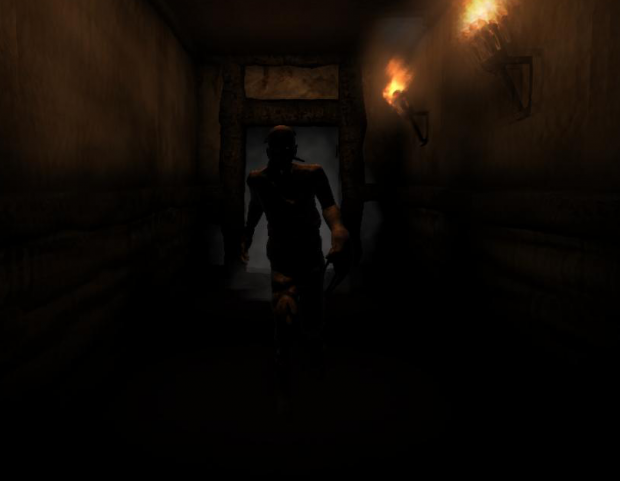 Look at nearly every Silent Hill titles: putting aside the graphical improvements, they're pretty much the same in terms of *what you see* and interact with. Plus, after properly testing myself, it's quite understandable why there's not much custom content: creating and modifying new low poly .dae files with the mod tools is extremely frustrating, to say the least. I'm personally not surprised. They modified the Collada format so much (or maybe it's just that inconsistent in the first place) that you have to use Maya versions 8 through 2008. I'm a 3ds Max user, and, even though I have the same version of the Collada exporter, files exported from 3ds max will have major skeleton problems. This makes it only useful for static props. As for Maya, animations and skeleton are perfect if you use version 3.05B of the exporter, but Amnesia's scale is very messed up, so you will always end up with a model that is far too big. Because it has a skeleton, this causes scaling to be disabled in the Amnesia model editor. Not to mention you will have the same problem as above if you are using Collada 3.05C. I'm still debating on whether it's worth it to learn Maya after using 3ds Max for so many years. Importing 3ds max models to Maya causes strange vertex artifacts only visible in Amnesia, so that is not viable for Max users. It's very obvious why there isn't any custom content. A friend and I played this addon together while talking on Skype. I believe this is the 5th one we've tried and most definitely the scariest one yet. Havi sure knows some clever ways and right time to scare the player. Its just as scary as some of the best parts in the original game. Thanks so much for making this map and I can't wait to see what you make next! So you die in the corridor and that's it? I have to say by the time I managed to get past the corridor my patience had already been worn thin by repeated deaths, and then a subsequent death led me to give up. I think you might need to sucker your players in more before presenting something hard like that. Gosh, this map is so frustrating. It's impossible to escape the zombie after having him break the door. Never, I repeat, NEVER EVER release something like this to the public! Inception music made it all worth it. Good map for a first try, work on clipping of models and textures other than that very cool and scary. I just played through this mod. I can't find the lever to open a hatch. I would like to continue this thing. If the darn AD didn't like to party in front of that steel closet. Gonna try this one tonight! The way that the monster keeps geting you so fast though he's far away it's ridiculous.This is not a playable custom story.Please don't do another one in the future. It wasn't so great. Not much of a story and no ambience or music, there was that cool script where the torch turned from red to green and a nice use of sound effects. A few nice puzzles but some lame jumpscares and mapping wasn't that great. I didn't like the mod. When i click door i see some color filter screen i think its a glitch and i want to fix it so i can play this map normally maybe its amnesia's problem or customstory problem can someone help me? Thank you.